Yesterday, Madison Avenue Spy highlighted an intriguing (if questionable) cobbler practice of adding red soles to shoes that don’t don’t happen to be Christian Louboutins — or in need of repair for that matter — by customer request. Given the shoe label’s ongoing run of design infringement-based lawsuits (most recently waged against red-bottomed styles by YSL and Brazil-based Carmen Steffens), we figured it would be particularly difficult to track the service down elsewhere. Not so. 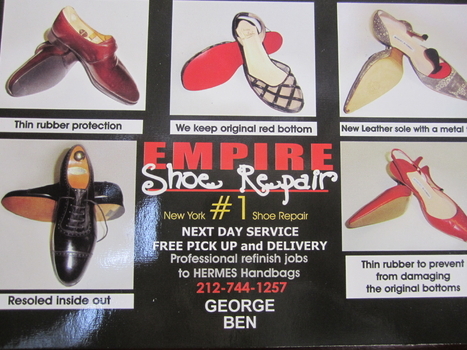 Lexington Avenue-based Empire Shoe Repair’s crew was happy to walk us through the hour-long, $34 process — from shaving down city-worn (or new) soles to adding traction to footbeds to prevent sidewalk slips. (In the case of genuine Louboutins, only the front half of the shoe is altered and the label logo is kept intact; for others, the only way to tell the difference is to take a close look at the Louboutin imprint-less inner arch.) And yes: While the practice is meant for Louboutin owners intending to maintain their soles, it’s clear that non-owners are cashing in on the look — and that local cobblers are cashing in on offering the service.